1. 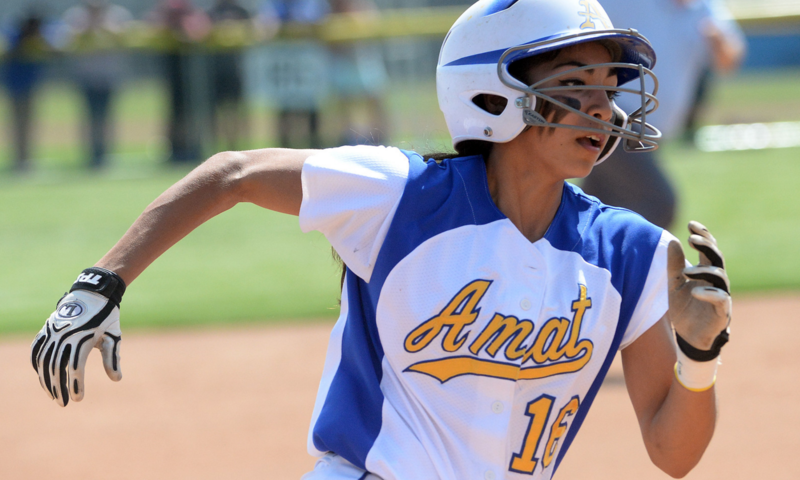 Bishop Amat (13-1) — No. 1 in Division 3 and looking the part with a 3-0 start in the Del Rey League. 2. Glendora (11-1) — Despite shocking 4-1 loss to Diamond Bar, they’ve played above expectations. 5. Diamond Ranch (9-3) — Win over Los Altos and sweep over San Dimas. Hacienda league favorites? 6. South Hills (7-7) — Even with Natalie Lugo’s 1.48 ERA and 102 strikeouts, Huskies don’t score enough to win consistently. 9. Wilson (5-2) — The Valle Vista is up for grabs and the Wildcats have as good a chance as any. 10. Arroyo (7-3) — Solid starts includes wins over Monrovia and Temple City. Who is leading in HR? Who is leading in RBI? Why is there no Maxpreps widget? No tweets of videos softball related? How are these rankings done? What goes into the process of ranking these teams? Question 3: The MaxPreps widget was created 5-7 years ago when MaxPreps allowed for it. There is no way to create one now, but I saved the coding from baseball to keep it usable. Question 6: The process is looking at how teams are doing, who they’ve played, what leagues and divisions they’re in, etc, etc. I guarantee by and large they’re given more thought and are more accurate than CIF polls. Nothing is perfect, everything is arguable, that’s why they’re polls. 1. That’s funny because you have one baseball player listed as leading in homeruns. I did a little research on Maxpreps and saw that there are plenty of stats for HR. It’s funny what you find when you actually look. 2. If I found that much on HR, I’m pretty sure that RBIs wouldn’t actually be HARDER to find. It’s not exactly hidden treasure that we are searching for. 6. One of your key points that “validates” St. Lucy’s at #3 is that they are undefeated against area teams (an unranked and 4-4 Sierra Vista team and an unranked 5-5 West Covina team). Edgewood lost to Glendora 20-2 and is still only two spots behind them. The only runs they got were on a HR by their best player. Why teams pitch to her, I will never understand. Diamond Ranch is not the favorite in the Hacienda League. Chino is the favorite and will be until someone beats them. You said that you look at who teams have played. Can you explain why a 7-7 South Hills is down at #6 behind DR, Edgewood, and St. Lucy’s? If you look at Maxpreps, they are playing the toughest schedule in the area and one of the best in the CIF-SS. I don’t believe that any team in the SGV outside of maybe Bishop Amat would have gone 3-2 in the TOC and 2-2 in the BOW. Wilson stands no chance in the Valle Vista. It amazes me that San Dimas is still in that league. San Dimas, no matter how good or bad they are, will always either win the league or come extremely close to it. South Hills started No. 1 and will climb back up the poll, Lugo is too good. But this is how polls are done, losses matter and they were .500 when the poll was created, which might explain why they’re not top ten in CIF Division 2 poll either. This goes back to a football argument where Bishop Amat could go 0-10 but in reality would probably still be better than every other area team because there losses would come against super non-league and league teams. But that doesn’t mean you rank them No. 1. That’s not how you do polls ,especially ranking teams who play in different divisions. You shouldn’t ignore the players that have coaches that post stats just because “several teams are not updating stats on Maxpreps”. Am I ignoring? I posted batting stats of coaches who do post. You’re not ignoring them completely, I admit that. But having HR and RBI totals for baseball player and not softball doesn’t look right. The girls work hard too. In coming weeks not only will there be HR and RBI but also ERA and W-L for pitchers. “In the coming weeks”, the season will be over and playoffs will be starting. I don’t understand what takes so long to do these things. Polls are weekly from here on out. Most publications wait until a third or half the season to post stats. But if you absolutely have to know daily, look on Maxpreps. And with that, I’m done. That explains why nothing new occurs with this publication. You’re following the herd instead of doing bigger and better things. There was someone on Twitter with four followers who seemed to create a profile just to ask a million times how we do our polls. I blocked you because you were dominating my timeline and starting to throw insults. If you want to share your thoughts, share them here, but don’t create a twitter just to dominate my timeline with your questions, ask here. Since you blocked me after saying that I need to create a post on the blog instead of tweeting you, here is goes. You mentioned that you look at the schedule, league, and division. I understand looking at the schedule. That’s the main criteria that should be used. Once a team’s league schedule starts, the league can be looked at. How is a team’s division used? Is it used as a tiebreaker when teams are similar? A D2 team would get the tiebreaker over a D5 team? Softball polls this early are difficult because for the most part, league hasn’t started. Tournament games in baseball and softball hard to judge, because they play 4 games in a week and pitching becomes a factor that wouldn’t normally be a factor during a league season. You can make arguments with any poll, be in or CIF that some teams deserve to be ranked over another. Head to head isn’t everything either, you can be 1-9 with your only win over a team that’s 7-3, doesn’t make you better than that team, it means you were better that day.